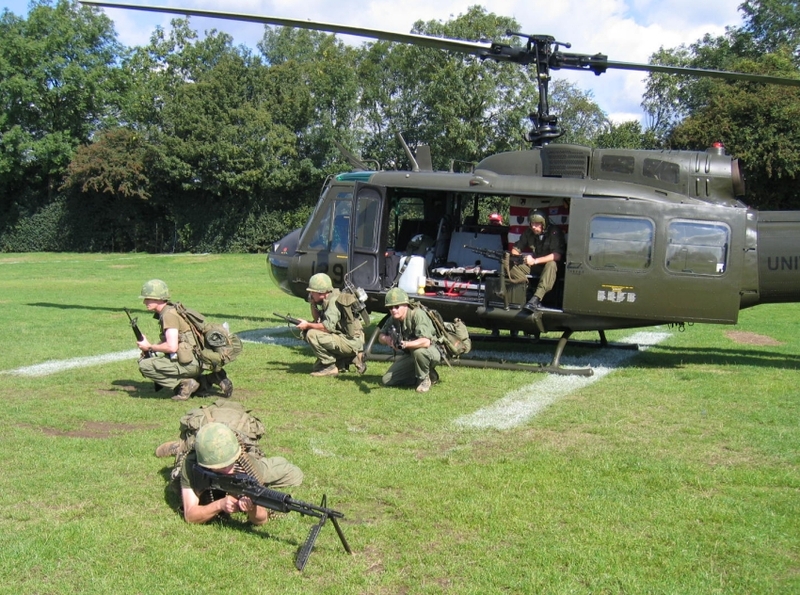 Huey attended Military Odyssey 2006, held at the East Kent Showground at Detling, over the Bank Holiday 25 to 28 August. She was crewed by her ‘Southern Display Team’ consisting of Rob Tierney, Neville Stops, Tracy Fitchett-Bowen and Douglas Bowen. All four travelled from the south, starting in the early hours of 25 August, to be able to fly the machine from Blackpool to Kent that day. Earlier on in the summer, Phil had asked me, Rob Tierney, if I would like to become re-qualified on the HUEY which I had not flown for some16 years. Can’t imagine why but I agreed! After a number of sessions at Blackpool the documentation was despatched to the CAA for their great big stamp of approval. But it had not arrived when we reached Wesham at about 0900 on the 25th – however, it was promised and it was on its way by special courier. Without these documents actually in my hand it would be illegal if I were to fly the machine. Great relief settled over us when the documents arrived about an hour later. By the time we had checked everything and returned the hire car to Blackpool airport we were not ready to depart until after midday – at least an hour later than the schedule I had mapped out for us. Huey lifted off at 1245 and soared into a clear blue sky orbiting Wesham several times whilst we checked in and out on the radio with Blackpool Tower and then checked in with Warton Tower from whom we had to obtain clearance to overfly their field on our way to the northern end of the ‘Manchester Free Lane’. Our route from the southern end of the Free Lane was direct to Wolverhampton/Halfpenny Green airfield for refuel. From there we routed to Oxford, Benson, Farnborough, Guildford and onto Rochester. Unfortunately, this route was about 20 miles too long to do without refuelling, hence the stop at Wolverhampton – a convenient roughly halfway point. Approaching Wolverhampton was a trip down memory lane for me as we passed only 5 miles east of Market Drayton where I had spent a number of very happy years living in the town whilst instructing at RAF Tern Hill. On this leg we had run through some rain and, not unreasonably, I had selected the wiper on only to realise that the blade was disintegrating. Consequently on arrival at Wolverhampton we spent some time attempting to reassemble it. Although we felt we had been successful we met no more rain on the trip and so our success was never tested. Wolverhampton refuelled us very promptly but we soon discovered that you do not set down in a Huey at an airport without being besieged by aircraft spotters. By the time they had been told the story we had been on the ground for over an hour. The weather promised fair for the next leg to Rochester. In practice, fair was an under-representation of what we met. As we flew over Oxford we could clearly see the jets leaving Heathrow and as we reached Guildford we could see the Isle of Wight out to starboard. A short while after overflying Benson, there was a squeal from the back. Tracy suddenly realised that quite inadvertently we were rattling through the near overhead of the village where she lived. I still don’t know whether she told the neighbours, nor what their reaction had been. At the Guildford VRP we turned sharp left onto track for the M25/ M26 junction just north of Sevenoaks. As we tracked East along the M25 at some 120mph we could see all the traffic on this Bank Holiday Friday afternoon at a stand still, for very many miles. This track enabled us to stay clear of the London and Gatwick Control Zones as well as staying well south of Biggin Hill. From there, a gentle left turn put us on heading for Rochester. As before at Wolverhampton, once we had landed we were besieged by Aircraft Spotters and airfield staff. Again a quick stop extended to a lengthy stay. Fortunately we were now only 4 miles from the show ground. At this point the Bowens left us but we took on board the Flying Display Director so that he could get an appreciation of the Showground and the obstacles around it. On each of the days, as well as being in overall control of us he was to be flying a display himself in a Yak. As we hover taxied along the ‘out of use runway’ to the intersection for departure, the controller asked if we were ready for an ‘immediate departure’. After replying Yes we were given clearance for an immediate take off. Consequently, our takeoff path included a 140 degree turn to port which left our fixed wing pilot somewhat bemused by this example of helicopter flexibility. At the site we were welcomed by the American Infantry Preservation Society [AIPS] a Vietnam war re-enactment group, with some very welcome liquid refreshment – it had been a long day including 2.4 hrs flying time. After beating off the inevitable admirers and securing Huey for the night, Neville and I were taken to our B & B for a well deserved rest and a meal. The plan for each of the following days was that around midday Huey would take off from her parking area within the AIPS Static Display area and would ‘fly in’ reinforcements for the ‘battle’ that was taking place between the Vietnam war re-enactors and the Viet-Cong and fly out ‘casualties’. Since the Display Permit does not allow the aircraft to carry anyone other than the pilot, it was fortunate that there was a bushy tree conveniently located along the centre line of the battle area, and the required distance from the crowd line, behind which the ‘reinforcements’ could be hidden until Huey had landed and behind which the ‘casualties’ could remain hidden after Huey had departed. Since we were limited to just 15 minutes airborne each day by the display organiser’s budget, it was imperative that Huey was not started up until its appearance was required. Hence I found myself sitting in the cockpit with everything ready for start up awaiting a ring on my mobile phone! However, it was a system that worked admirably and enabled us to meet the flying time requirements. The flying was not over demanding but it was necessary to enter and leave the battle area downwind so that the inclusion of the aircraft did not compromise the battle plan. On the first 2 days the wind was quite light and so was not a problem but on the third day it was stronger and thus presented some additional considerations. Throughout the 3 days the aircraft was available to a limited number of people for visiting. Several groups had their photos taken with the aircraft as background. Clearly, the AIPS were one group but ‘The UK Tank Club’ invaded us, roaring over with their model 3 foot long tanks and formed up in front of the cabin door. Conflicting and confusing thoughts also occurred when one saw people dressed as Roundheads and Cavaliers or 15th Century milk-maids sitting in the cabin pretending to fire the machine guns! Many people asked questions and at times I felt that I was being examined such was the complexity of some of the questions. Remind me to swot up on my helicopter Principles of Flight before I attend any similar shows next year! Each time the aircraft took off or landed it was watched by significant crowds around the 70 m radius perimeter. Without doubt it was quite a crowd puller. My overall impression of the Show was that ‘Yesterday’s high technology had become today’s hobbies’. This very much summarised a near neighbour – a 120mm artillery gun and its 6 wheeled tractor unit. Then there were the jeeps, DUKWs and 2nd World War Fire Appliances. 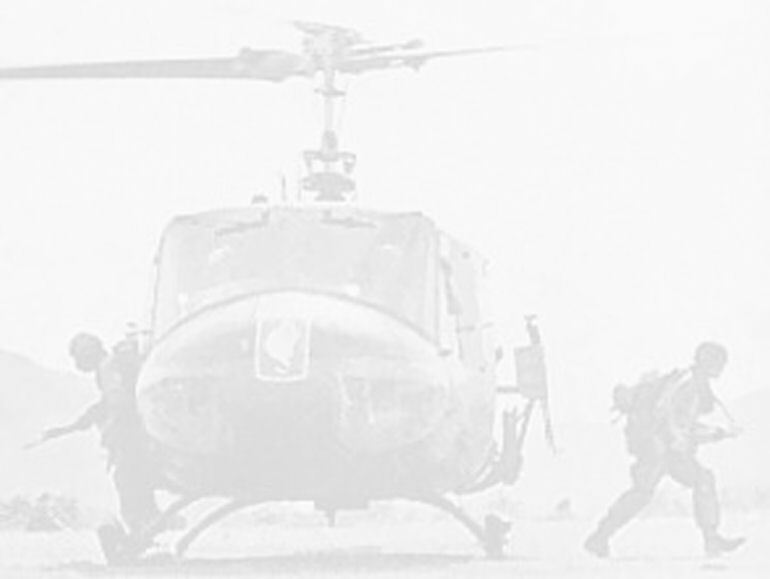 The significant difference was that Huey was doing what it was designed to do – fly. The guns could not really fire, even blanks, and there was no water for the DUKWs and no fires for the Fire Appliances (fortunately). The final sortie was to position the aircraft at Redhill so that Phil could take it to the Jersey Airshow some 2 weeks later. The half hour trip was quite rough as there was significant turbulence by this time as the wind had increased in strength from earlier in the day but as on the trip down the visibility was excellent and we had a ‘grandstand’ view of the Dome and Canary Wharf up to the North. Over the 4 days we had flown 3.7 hrs with no significant problems. On one occasion, the engine failed to light but succeeded on the second try after the throttle had been opened a slight bit more. 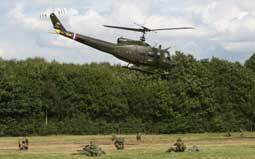 Otherwise, as is the norm with Hueys, utterly reliable. Thank you very much Phil for giving me the opportunity to relive THE experience again. From the left hand seat Neville Stops adds: it was great to be back in a Huey again. Rob and I have lived in the same village for some years and I helped and crewed Rob when he was flying G-Huey. 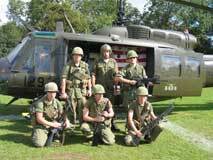 I hold a fixed wing licence, and my part in the Huey crew was as Navigator, ground liaison and in some cases commentator. The trip down went with out a hitch and as Rob has said the vis was incredibly clear. When we arrived at Detling, having never been to a re-enactment week end before, I was very surprised at how authentic everybody was both in dress and equipment. We were part of the ‘American Army’ and they were very relieved that we had arrived because our appearance had ‘hung on a thread’. 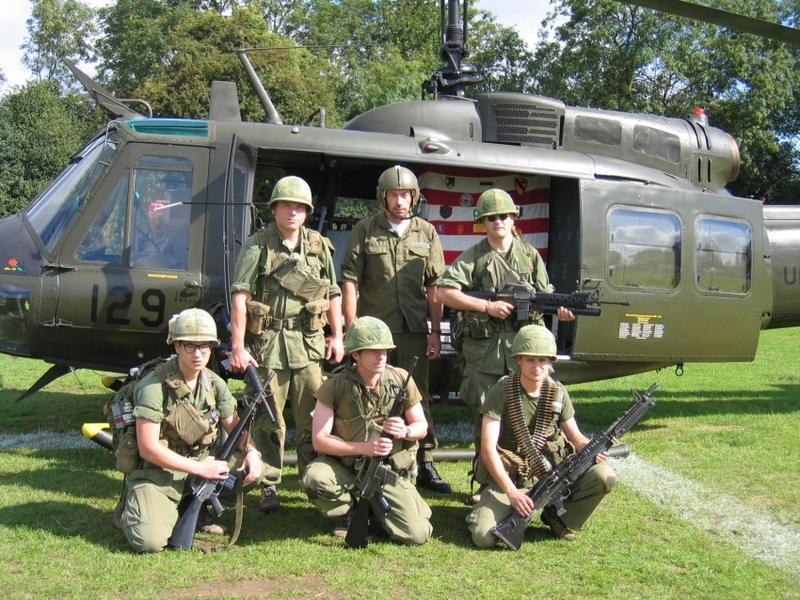 This was a ‘first’ for them using a Huey in their battle scene. The reason for Rob awaiting the phone call was to save draining the Huey battery. Once the helicopter engine was started we were able to use a ground to air radio. It rained on only one day over the bank holiday weekend which is surprising and the rest of the time it was very good weather. The whole weekend was extremely successful. We also raised money for the Blackpool Air Ambulance with a donation tin as they too are based at Blackpool airport. We were kept very busy all weekend showing people around the Huey, and we thoroughly enjoyed talking to so many people who had an interest in the aircraft and her history. 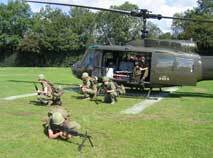 We especially enjoyed showing the children around and telling them all about Vietnam and what the Huey would have been used for. 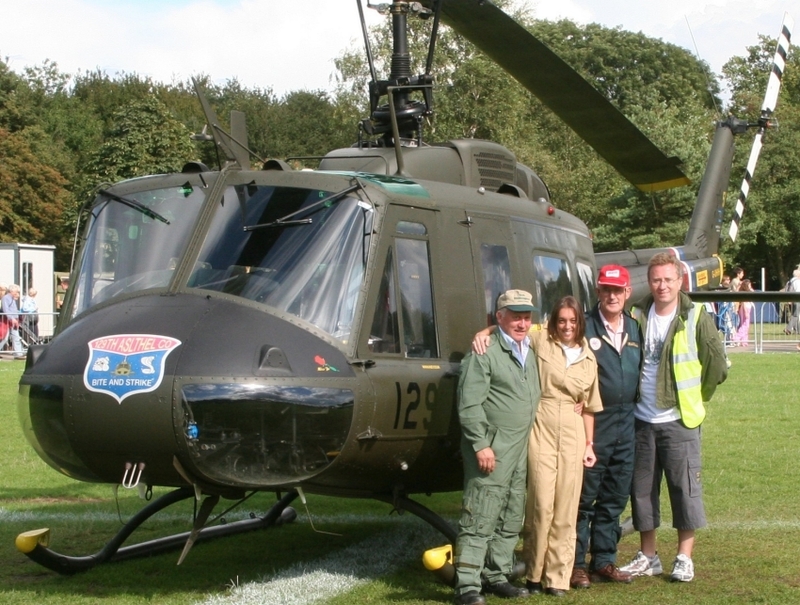 Thank you Phil for also giving me the opportunity to crew a Huey again, and especially a helicopter that has been restored to such a high standard.